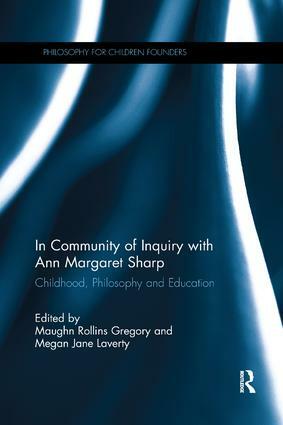 Philosophy for Children Founders offers a critical re-assessment of the work of the founders of Philosophy for Children – a movement encompassing all approaches to the philosophical practice of children and adolescents – in light of developments inside and outside that movement. Within the span of fifty years, philosophical practice for children and adolescents has become a global, multi-disciplinary movement involving innovations in curriculum, pedagogy and educational theory; in moral, social and political philosophy; and in discourse and literary theory. It has even given birth to a new academic field: philosophy of childhood. Contemporary scholars, educators and practitioners are engaged in robust debates, not only about how to research and practice philosophy with children and adolescents, but also about the very meanings of philosophy, childhood and education. These debates involve contested readings of the movement’s history and echo differences that arose among its early proponents. Philosophy for Children Founders seeks not to resolve these debates but to inform them with a historical perspective on the internal complexity of the movement’s central concepts, theories, and practices. Each book in the series provides a single-source, critical anthology of the work of one founder of Philosophy for Children. The books are organized in thematic sections given to the founders’ most important scholarly and pedagogical innovations. Each section is introduced by a contemporary scholar who critically evaluates the founder’s work in a particular area and who has selected the essays to be reprinted in that section. The introduction to each book combines a biographical sketch with an assessment of the founder’s influence in the movement.